More Lionel Messi in the Champions League? Yes, please. And we will not have to wait long, as the quarter-finals of the most elite European club competition are only two weeks away. Barcelona, the favourite to win the 2017/18 edition following the performance in the last round, have had a relatively fortunate draw and are matched up against AS Roma, a team in the midst of a rebuild. It has been a real treat watching Messi play lately. Especially in the last round of the tournament, mazing through (and often nutmegging) whoever appeared in front of him. And with the World Cup coming this summer, the probability of the great Argentine playing top level football are high. And it is not just Messi. The recent signing from Borussia Dortmund, the France international Ousmane Dembele, is playing great football since coming back from injury. Did you catch his goal vs. Chelsea? AS Roma are happy to be among the last eight. They had an awesome Group Stage campaign, finishing ahead of Chelsea and Atletico Madrid. In the Round of 16 they eliminated Shakhtar Donetsk in a tightly contested tie. Roma have freshened up this summer, letting go of some veteran players, including Francesco Totti, and bringing in younger reinforcements. They are spearheaded by one of the top strikers in the game, Edin Dzeko, while in midfield, they can always count on the services of the versatile Radja Nainggolan. As it is great to see two Italian clubs in the quarter-finals, it is very likely that AS Roma will see the end of their journey in this round of the competition. FC Barcelona have already wrapped up their La Liga title and have a lot of energy to focus on the Champions League. Roma, on the other hand, are fighting to stay third in Italian Serie A, a spot that guarantees them entry into the Champions League next season. The two teams last met in the 2015/16 Champions League Group Stage, with Barcelona winning 6:1 over two matches. Enjoy the match everyone. Maybe we will get to catch more moments of brilliance from the 2018 Ballon D'Or favourite Lionel Messi, but either way this should be an entertaining quarter-final. 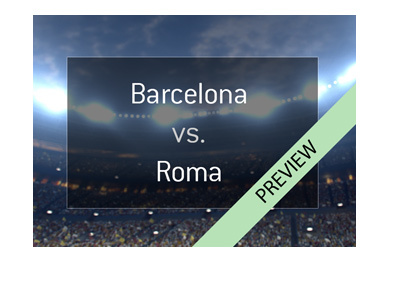 Can Roma stage a massive upset here?